When Liz pointed out the lone stand with lemongrass in Tel Aviv’s Carmel Market a few months ago, I immediately became excited. It’s one of those ingredients that some of my favorite recipes call. It can be omitted, but you always get the sense that something is missing. You don’t need a whole lot of lemongrass to get the impact, and so Liz and I split a bunch and I quickly began thinking of how to put it to good use. 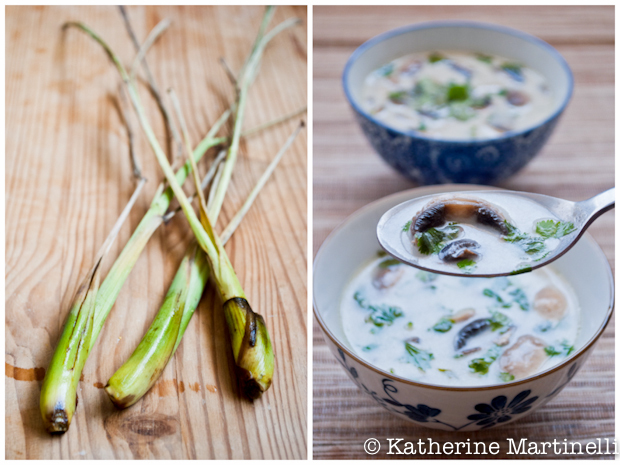 In an instant I knew: Coconut mushroom soup, or Tom Kha Hed. This is one of those dishes that shows up on American Thai menus often, but I get the sense isn’t so far off from the real thing. Lemongrass (cymbopogon) is indeed actually a grass that is native to Asia, and has a citrusy flavor with distinctive hues that are simultaneously sweet and tangy. To get the most out of it, use the slightly thicker root ends and bruise them with a mallet or back of a knife, then infuse the lemongrass in whatever you are cooking. Here, I’ve infused the lemongrass in a simmering mixture of coconut milk (one of my favorite ingredients of all time) and vegetable stock. I’ve also used lemongrass to make delightful flavored simple syrups for drinks, and there are lots of other uses. Calling this soup Tom Kha Hed is a bit of a misnomer since the “kha” means galangal and I did not have any of that (“tom” means soup and “hed” means mushroom in Thai), but it tasted pretty darn close to anything I’ve ever had in a restaurant. The flavors are clean and bright, and it’s about as summery as a hot soup can get. You can turn this into an even more substantial meal by adding chicken or tofu. And – bonus! – it’s ready in about 20 minutes! This Thai-inspired, lemongrass infused coconut mushroom soup is a bright and flavorful way to start any meal. Ready in about 20 minutes! Put the coconut milk, vegetable stock, and bruised lemongrass in a pot and simmer over medium-low heat for 10 to 15 minutes, until the liquid is infused with lemongrass flavor. Remove the lemongrass. Add the mushrooms and cook for another 5 minutes, until just softened. Serve this with Tofu Satay, Curry Puffs and Shrimp Coconut Curry for a complete Thai meal! Too funny – I spent most of the day doing a coconut post for later in the month! I would have snapped up the lemongrass as well, I love it as tea with fresh ginger 🙂 The soup sounds lovely! What a great soup. I haven’t ever cooked with lemongrass. The soup looks wonderful, especially since I really love Thai dishes. I’ve added my coconut tartlets recipe, thanks again for hosting!! We just returned from Thailand this week and I enjoyed a soup like this while we were there. I had no idea it was so simple! Thanks for the great recipe! Mmmmmmmm…your soup looks fantastic, Katherine! And I want to try every single dish linked up…I love coconut!!! Being vegan ( right now) and gluten free, I love your soup ! Can’t wait to try it.. I added a mango Popsicle made with a coconut milk base and a tomato coconut soup. I LOVE this Thai Soup!!! So simple and tasty! I don’t use lemongrass near as much as I should because I just love it! Thanks for the inspiration and thanks for another wonderful hop! This looks amazing. 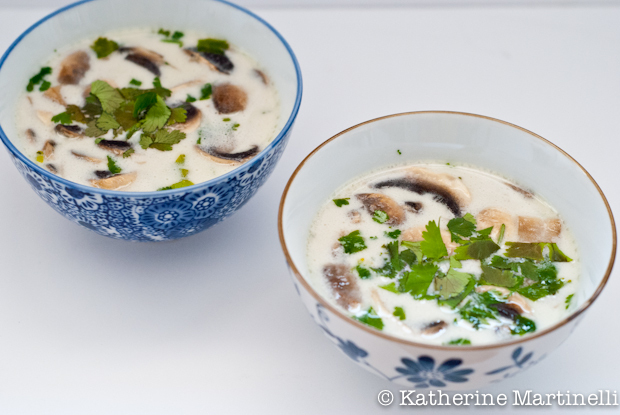 Coconut/coconut milk is one of my favorite ingredients, and I order Tom Kha Gai soup (very similar to this) every time I go to a Thai restaurant! That and Tom Yum soup are my absolute favorites. I have to make this soon! I LOVE thai coconut soup! There’s a restaurant in the town I work in that has delicious coconut seafood soup and I just adore it. I’m definitely going to try out your recipe – it looks fabulous! With lemongrass and cilantro, I know I’d love this soup! What a fabulous theme, allowing for so much variety! So many wonderful recipes and your soup looks divine! Coconut is such a versatile theme! I love the soup you posted – I am in heaven with just about anything Thai! I know I would love this soup. I was psyched to see the coconut theme! I’m a fan!!! I love this soup! I have to try making it at home… I leave you a coconut cake. I love Thai soups and this is one of my favorites. Thai soups always seem to pack in lots of flavor without becoming too rich. Which is a good thing for me. As always, your dish looks amazing! I actually don’t have any coconut recipes to share, but I’m loving browsing through all the amazing looking dishes here! Adore Thai kitchen..the soup looks lipsmacking! Such a very simple soup with such a depth of flavour! Now: lemongrass – I don’t know from where all you readers blog, of course, but – I live in an ares of Australia with cool-cold winters and quite hot summers: officially in garden magazines we are deemed as ‘temperate’. I have absolutely no problems with growing lemongrass in pots: yes, it gets kind’of ‘ratty’ during the cold months, but is still usable. I have about four pots and have no difficulty whatesoever in ‘using my own’ through out the year! Hope this is of some help!! Nothing like the real McCoy 🙂 ! This looks so tasty and refreshing! Love it. I love how simple this soup is but complex the flavors! If you ever need more lemongrass while in Israel stop by, it’s one of the only plants in my garden that thrives in the heat. The soup looks wonderful. I’ve got a version that I do, but it’s quite heavy on the curry, which sometimes is a bit much. Excited to give yours a try! One of the things I miss about living in Florida is the lemongrass – we had quite a bit growing in our garden. It has such great flavor! And it looks like it’d work so well in this soup. Good recipe – thank you. Lemongrass, mushrooms and coconut! Mmmm.. What a divine combination! Oh my goodness, Katherine, you’ve just changed my life. This is one of my favorite dishes of all time, and I had no idea how easy it is to make! You’ve converted me. I LOOOOVE this recipe! I shared it on my blog this week, http://healthylittlechanges.com/2015/11/09/recipe-roundup-its-soup-season/. Thanks for a great dish! So happy to hear it!! Thanks for sharing the recipe! Hmmm I’m eager to try this. I’m not sure how large fresh lemongrass is, I could only use paste. Could you please mention how many tbsps if I need to use this stuff?